Declan Barron has offered to do some research on Robert De Niro's Irish ancestry in a comment on this post. It is noted that Edward emigrated in 1855, and was a naturalized citizen. De Niro has another pair of Irish immigrants in his ancestry that might also connect him to Clare. Dennis O'Reilly married Mary Burns, whom we identified as a daughter of John and Mary Burns of Syracuse. From the 1900 census, we learn that both John (b. Mar. 1835) and Mary (b. Dec. 1839) had emigrated in 1860, that they married about 1861-62, and that they had a daughter born in "Canada (Eng.)" in 1866. Elsewhere in the census we find that their daughter Mary (De Niro's great-grandmother), was born 1878 in Vermont (later censuses say New York). If you want to pry more into Mr. De Niro's past, please do, and post your results below. 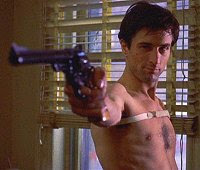 And if you are Mr. De Niro, I am dreadfully sorry for calling you "Bobby."